The Old Federal Mill contains the remnants of a technologically innovative sawmill, including concrete machinery foundations, three sawdust heaps, steam winch components, a skyline carriage and modified tram wheels. The mill was operated by the Federal Timber Company from 1922-1934, and cut large volumes of scantling and barrel staves. Timber was despatched to Warburton along the Starvation Creek outlet tramway, remains of which include earthworks, and two large pig-sty bridges. Extensive artefact scatters associated with the mill settlement are distributed along the outlet tramway north of the mill, including glass, ceramics, bricks and metal. The Old Federal Mill is of archaeological and historical significance to the State of Victoria. The Old Federal Mill is historically significant for its associations with Jack Corbett, a French Canadian who introduced North American methods of logging at this mill, including skylines, high lead winching, and multi-drum Washington winches. 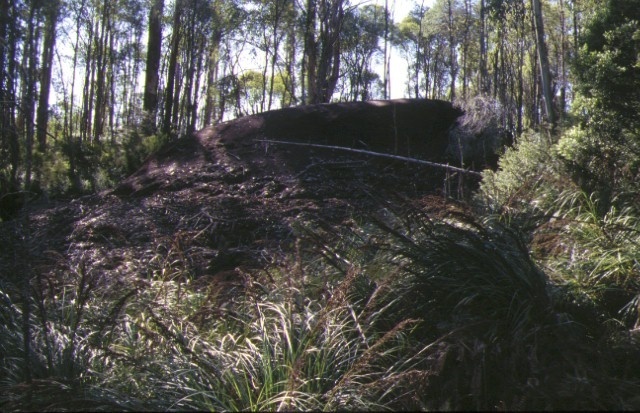 These techniques enabled very rough ground and steep gullies to be successfully logged, and were quickly adopted by other mills in Victoria. Logging tramways at the mill were also significant for being built to the unusual gauge of four feet, permitting greater stability for the transport of larger loads. The Old Federal Mill is archaeologically significant for the comparative intactness of its remains which demonstrate the innovative technology originally employed at this mill. The site is also significant for its potential to yield artefacts and evidence relating to the cultural history of sawmilling settlements. Old Federal Mill, Starvation Creek, Warburton, Yarran Ranges Shire. 1. All of the Crown land including concrete machinery foundations, sawdust heaps, surface artefacts and any other remains of sawmilling activity within a 200 metre radius of a point with Australian Map Grid co-ordinates E014 N150 on 1:25,000 Map Sheet No. 8022-2-1 McCarthy. 2. The Federal Timber Company's outlet tramway, and all the Crown Land on each side of it for 50 metres, from where the tramway crosses Big Creek Road (E013 N155 on 1:25,000 Map Sheet No. 8022-2-1 McCarthy) to the remains of the mill shed (E014 N150 on 1:25,000 Map Sheet No. 8022-2-1 McCarthy).